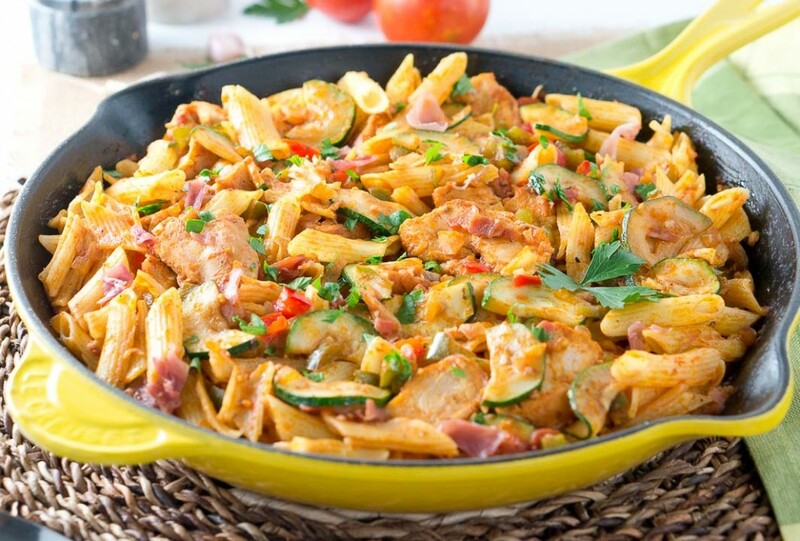 Italian Chicken and Prosciutto Pasta Skillet – delicious recipe that perfectly combines all the flavors: prosciutto, chicken, pasta, peppers, zucchini and flavorful thick and hearty roasted garlic tomato sauce! This pasta recipe is true comfort food! It absorbs all the wonderful flavors in the dish, and with every bite, you taste all the delicious and flavorful ingredients. By combining our love for Italian food, I was able to create a delicious recipe to add to our family dinner traditions for years to come and I can’t wait to share it with you all. It’s easy, comforting and ready in about 30 minutes. I love Ragu’s Homestyle pasta sauce because the dishes come out great every time I use this sauce. They are also free of artificial flavors, artificial colors or high fructose corn syrup. In today’s dish, I used the Homestyle Thick and Hearty Roasted Garlic Sauce. It’s thick and hearty, and so flavorful! There are several different varieties available, so make sure you check them out here. As Fall draws near and days become shorter, I am loving all these quick and easy comfort recipes. And with an easy shortcut, this recipe is a great addition to your weekly meal plan. You have probably seen several other Ragu recipes on the blog if you have been following my culinary adventures. That is because I am a huge fan of their Homestyle sauces. They are healthy, and so flavorful, and make every meal taste amazing! Their sauces are definitely a staple in my pantry. If you are looking for an easy and delicious weeknight meal, your family will love this Italian Chicken and Prosciutto Pasta Skillet! This recipe makes a lot (about 6 servings) and refrigerates well. Hope you enjoy it! Season chicken breasts on both sides with garlic powder, paprika, salt, pepper and Italian seasoning. Slice chicken breasts in about 1/2” strips. Cook chicken slices in a skillet over medium heat for about 10 minutes, turning halfway through, or until they are cooked through and no longer pink in center. Set aside on a plate. While chicken is cooking, cook penne pasta according to package instructions. Sautee onion, garlic, and peppers in the skillet over medium-high heat (about 5 minutes). Season with salt and pepper to taste. Add sliced zucchini and cook for couple more minutes, until zucchini is tender. Pour chicken broth and tomato sauce to the skillet and stir well. 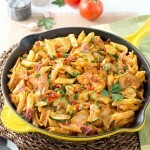 Add cooked pasta, chicken and prosciutto to the vegetable mixture in the skillet, and stir. Serve warm and garnish with parsley or basil. 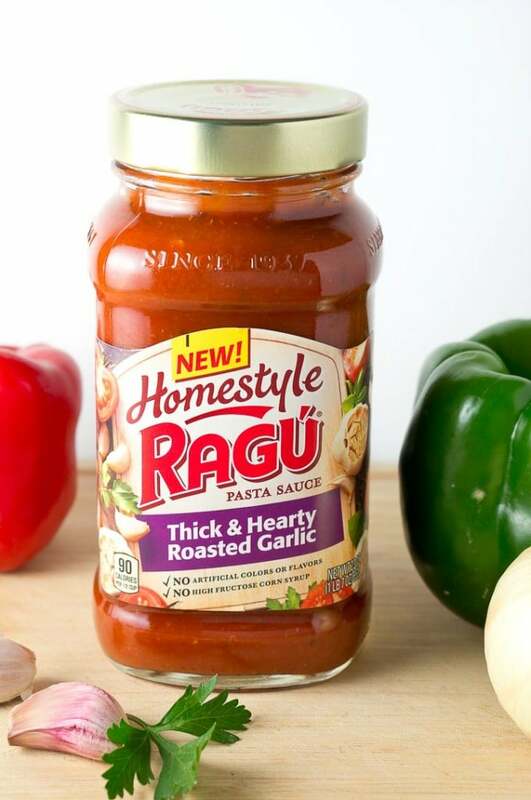 If you’re looking for more great recipe ideas using Ragu’s Homestyle pasta sauces, visit Ragu’s website to learn more about the new line of Ragu Homestyle sauces. You can find tons of great ideas for your next weeknight dinner. They have Spicy Veggie Quesadillas, Rustic Italian Bowls, Spaghetti Puttanesca and more! 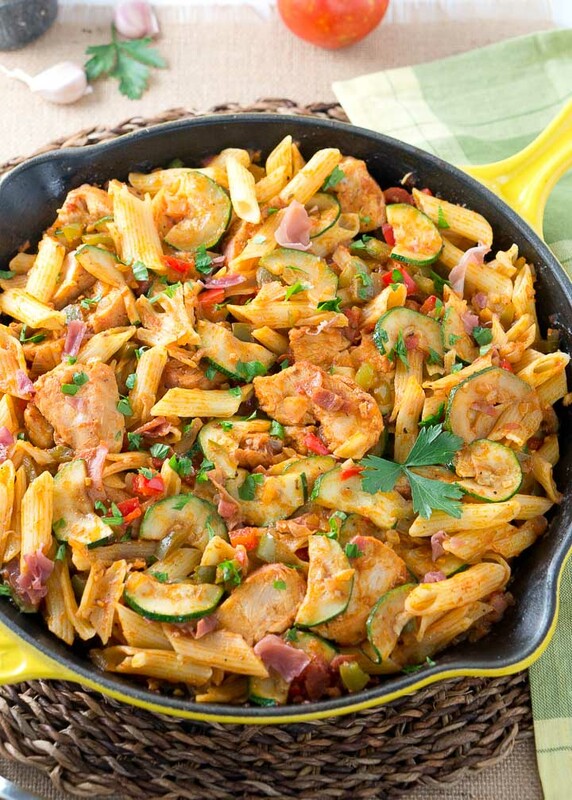 This Italian Chicken and Prosciutto Pasta Skillet recipe is true comfort food! It absorbs all the wonderful flavors in the dish. Season chicken breasts on both sides with garlic powder, paprika, salt, pepper and Italian seasoning. Slice chicken breasts in about 1/2” strips. Add the olive oil in a large skillet and cook chicken slices over medium heat for about 10 minutes, turning halfway through, or until they are cooked through and no longer pink in center. Set aside on a plate. This pasta dish looks perfect. Anything with prosciutto is great in my book! This is my kind of recipe. It’s easy to follow, healthy and looks delicious! Can’t wait to try it. This really does look amazing. I am going to have to make this for the family. Thank you.. I don’t think there is anything more comforting than a big pot of tasty pasta, this looks delicious! Yum! Such a hearty and yummy looking family meal! My kids would love this, I think! I really need to get myself a skillet, as it looks like there is so much that you can do with it. This looks delicious – love all those veggies. Beautiful photography! Recipe looks great. I see that 2T of evoo is listed in the ingredients but I don’t see it added in the directions. I am sure it is when you cook the chicken and veggies but maybe confusing to people just learning to cook. 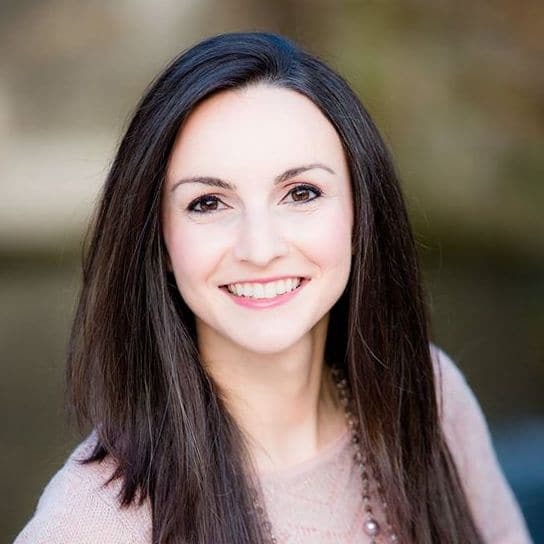 Love that you are into healthy and show the nutritional values of a recipe. So many recipes say low calorie or healthy but with no nutritional values listed. What they think is healthy or low calorie may not be what I think. So thanks again.